Ransomware is attracting widespread attention, and for good reason: once ransomware—a type of malware—infects a device, it covertly encrypts data and renders files inaccessible. To free the system, the malware demands a ransom payment. You must choose: pay the ransom or attempt to recover your lost data through other means, such as backups. Meanwhile, the ransomware may be spreading throughout your network and every device that connects to it. The impact for a single user—never mind an organization—can be severe. Hospitals, for example, may be unable to admit patients, conduct surgeries, or dispense life-saving medications. At financial services firms, securities trades could be frozen. Ransomware is expected to gross cyberthieves $1 billion this year. In fact, just one ransomware program, Cryptowall, is estimated to have generated $325 million from U.S. victims last year alone. The concern around ransomware is not hype, it’s real. These attacks have cut across every industry and are driving a flurry of questions about what is the right response. Gartner is at the forefront of helping customers develop strategies for tackling malware, including ransomware. There are steps you can take to actively reduce the number of ransomware infections across your organization. 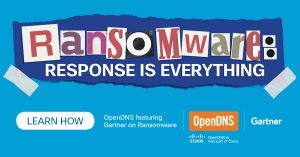 Peter Firstbrook, a leading authority on endpoint and server protection strategies and VP of Research at Gartner, and Dan Hubbard, OpenDNS CTO, got together to address the explosion of ransomware in the market and the simplest way for security practitioners to stay ahead of these attacks. The resulting insight is worth a review. So what are the best ways to avoid a ransomware attack? Hackers are constantly refining their strategies, so a multi-layered defense is critical. As you begin to build or enhance your ransomware defense, the key question to ask yourself is: Where do you currently enforce security? A multi-layered defense is essential to protect your critical business systems from ransomware in particular, malware in general, and a host of other evolving threats.